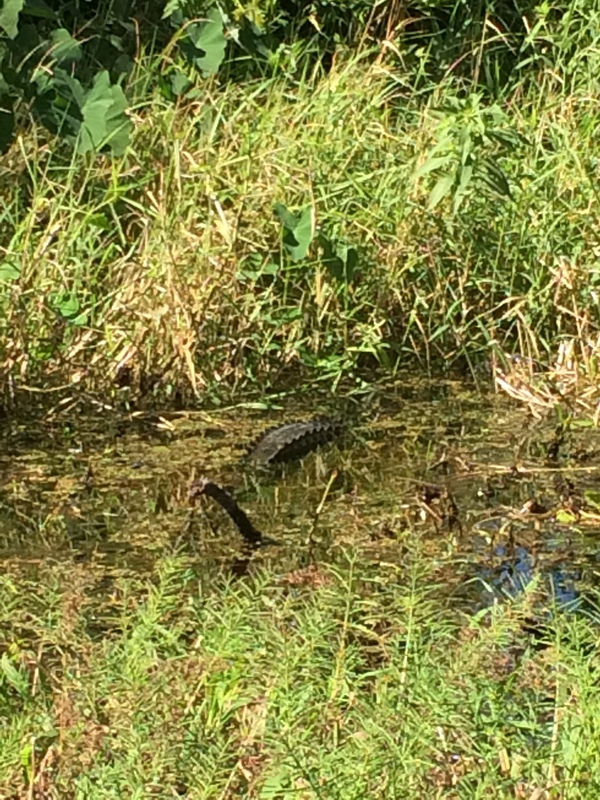 2017 Florida Alligator Hunting Guide: Yes that’s a VERY Large Swamp Lizard….. This is JTgatoring’s Alligator Hunting Guide. You will learn about the amazing Florida alligator hunting season, from the beginning to the end! Keep in mind, that there is a few ways to hunt alligators legally in Florida. In this guide, I am talking about the Statewide Alligator Harvesting Program. This is for hunters and viewers who are interested in learning about alligators! This is a simplified guide, if you need more in-depth information go to the FWC’s site. It will be linked at the bottom of this guide. This is how its broken down! Information and Safety – The legal process and winning the lotto! Equipment – This aint Swamp People, No Guns! Tactics – I can’t use a gun?! The legal process and winning the lotto! There are more than 1.3 million alligators in Florida! The alligator is classified as “similarity of appearance to a threatened taxon”. In short, the alligators are federally protected because they look too similar to the crocodiles and caimans that are endangered in Florida. 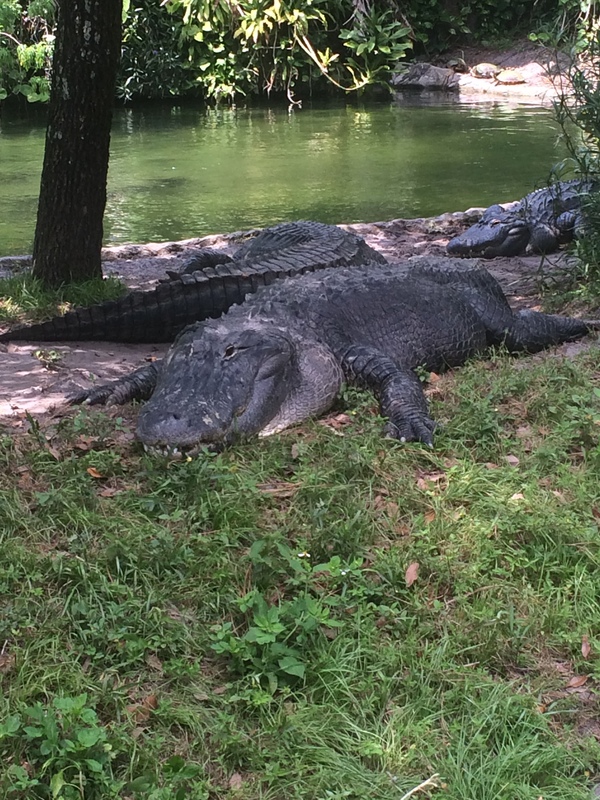 Yes, there are crocodiles and caimans in Florida. South Florida is the only place where you will find the American Crocodile and the American Alligator coexisting in the wild. So to keep everything in check, and to raise some funds, the state of Florida assembled a Statewide Alligator Harvesting Program in 1988. To get an alligator tag, you submit an application into the state of Florida. I like to call it the “alligator lottery“. You have to be 18 years old to apply. There are different phases for drawing and it can get pretty confusing and boring but the application and drawing phases normally start in late May or early June. On your application, that is online, you apply for the hunting areas you want to hunt, and then the state does a random drawing, like a lottery, to determine who gets the tags for that area. You can apply for tags in two different types of areas: county wide areas and then specific harvesting units. County wide areas are done by county. You can hunt in most of the public water ways in that county. You can also hunt on private body of waters with the landowners permission. Specific harvesting units are special bodies of water like major lakes, major water systems, and/or specific areas in general. It is free to apply, but with a resent change, you do have to submit a credit card number. If you are awarded a permit, the cost is around $275 for residents or $1,022 for non-residents. 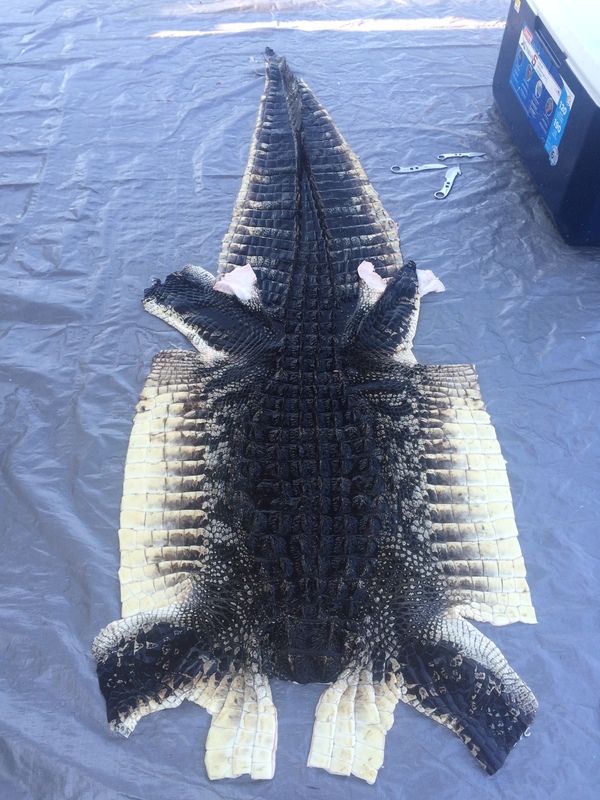 The cost pays for an Alligator Trapping License and two CITIES tags. So to the point, $275 to be able to take two alligators. You got your two tags that cost you a pretty penny now what? Look to see what harvest period you got! There are four total harvesting periods. You will either get Harvest Period 1, 2, 3, or 4. The make up period (Sept. 12 – Nov. 1), if you are unable to fill your tags during your harvest period, you have a chance to fill them during this make up harvest period. 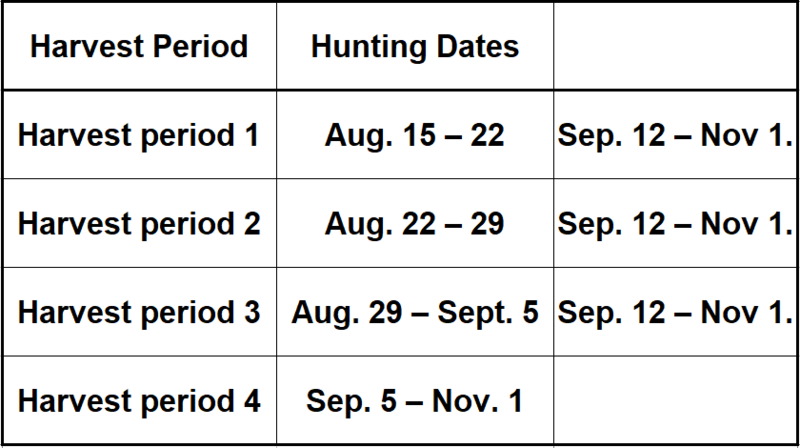 You can hunt from 1700hrs (5 pm) to 1000hrs (10 am). Which means you will mostly be hunting at night time. 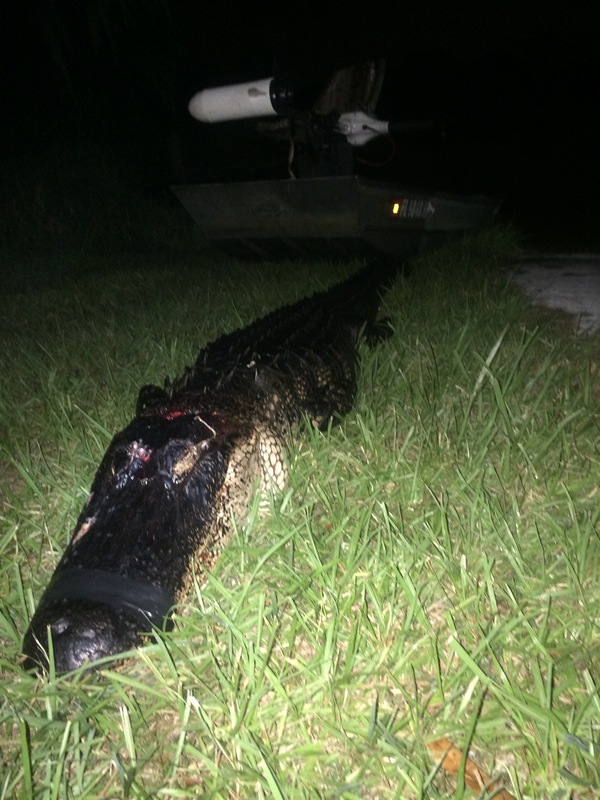 Sometimes you’ll get lucky and get a gator before the sun goes down but most of the time it is at night. Everything you need to know will be in your packet that you will receive from the FWC via mail. Not allowed to use firearms! 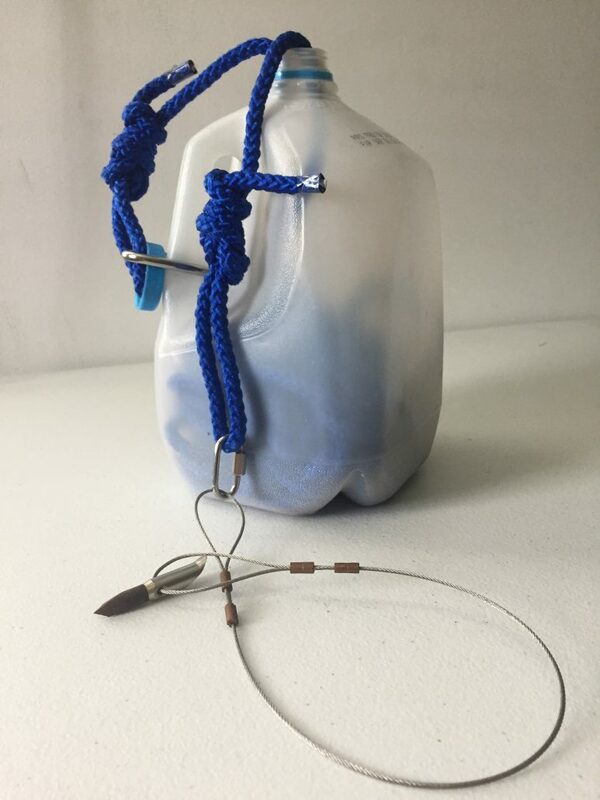 – A fishing rod and reel with a weighted treble hook that you cast over the alligator to snag it with the treble hook. I use a flats rod, 3500 spinning reel, heavy braid, and a 12/0 weighted treble hook. – You can use either one or both. Just have a line attached with a float (I use the AMS Kit. There is a special kit for this situation). I have also dispatch an alligator this way also. You have to be close enough to shoot it, so it is normally not the first method of attaching a line to an alligator that I would use. – A dart with a line attached to it. You use a long pole to insert this dart under the hide so you have a secured line attached to the alligator that in most cases wont come out. I will do product reviews on most of the techniques listed above where I will go over the product and how I use them. – No Hooks! – In Florida you are not allowed to use hooks unless you are a nuisance trapper. For hunting you have to use a wooden peg that is less than 2 inches long. 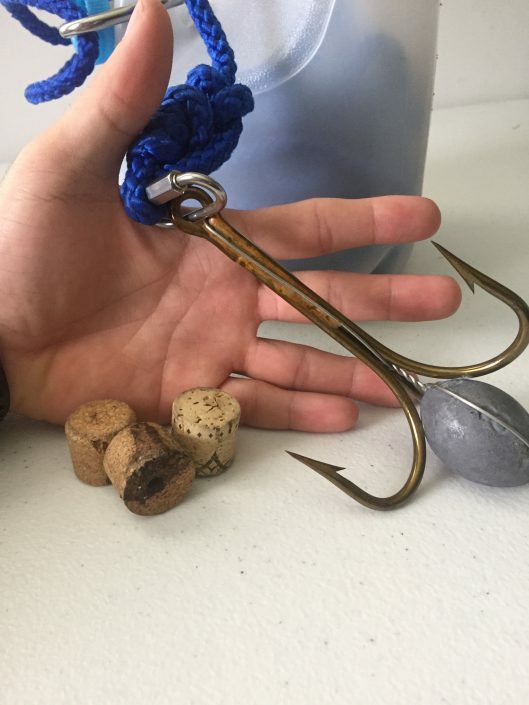 A good idea to attach the bait to the peg is a rubber band or just tie the bait on to the peg. 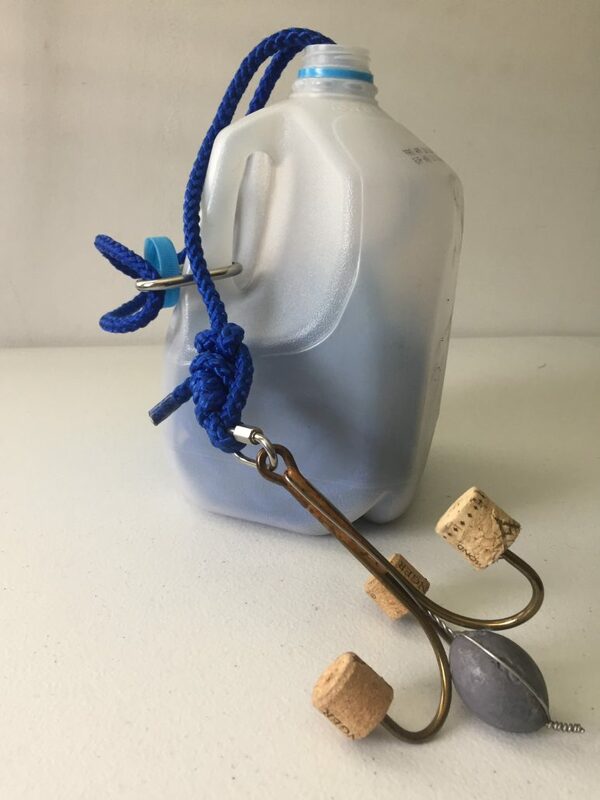 The peg can then be attached to a fishing pole or a hand line that is attached to the boat. You can not hand bait and leave it. – Normally a bigger treble hook than the treble hook that is on the snag hook rod and reel. Has more weight to it and is normally a hand line. I use a rope that isn’t to big to handle but not too small where it will get tangled. Normally used when the alligator is near the boat and you need to put a lot of pressure on the alligator. – A 6 foot to 8 foot pole that has a bang head on it. The bang stick head holds one cartridge of a specific ammunition. You have many different calibers to choose from but I use a 357 magnum. You slam it hard on the alligator’s kill spot, behind its head on the half moon, to dispatch it. How it works is that it is spring loaded where the cartridge is sitting right above the firing pin. When you slam that cartridge up against a hard surface, the cartridge is pushed against that pin, igniting the primer, discharging the bullet. – A light that can mount to your head or hat. So when ever you look around at night, you can see what you are looking at. 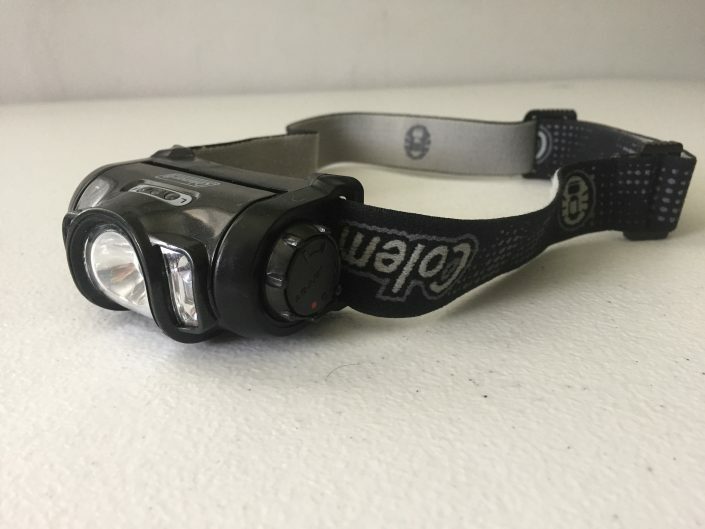 You can also use it to shine for alligator or simple blind the other people on the boat as you make eye contact with them. – Used to shine for alligators at night. An adjustable spot light is best where you can dim light when you start getting close to an alligator. If shine the alligator for too long you may “burn” its eyes and it will go under the water. 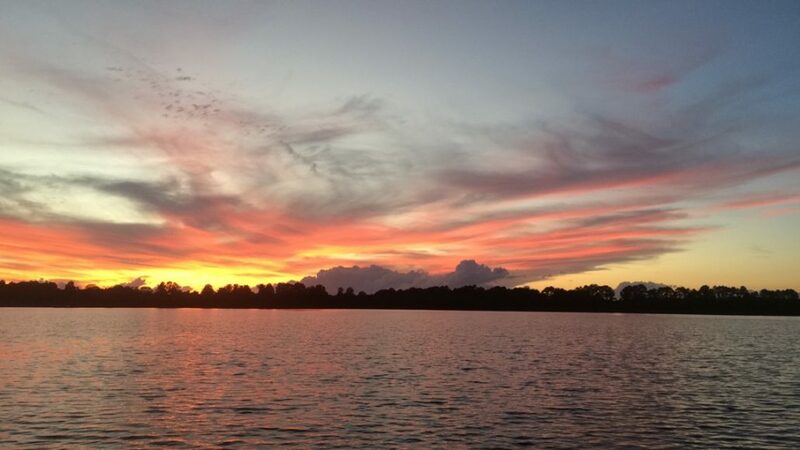 – Right before sunset, you can use a nice pair of binoculars to see where the alligators are at. You can also use them for scouting for alligators before you go hunting. I really recommend a good pair like these – I have used these for years. 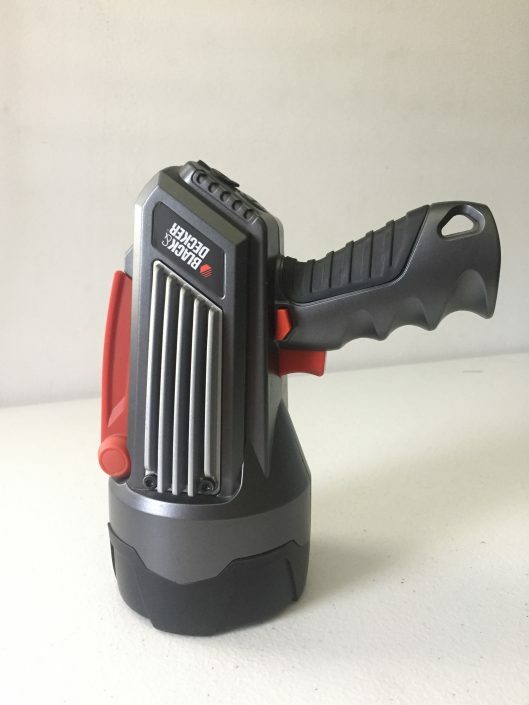 They have a variable zoom and are fantastic. With the specific alligator hunting equipment (listed to the left and above) there is still a few things to consider. Depending on where you are hunting from, you will need different equipment along with different tactics. For example, you can hunt alligators from the shore or from a boat. When you are on the shore and you have no boat, you cant chase after the alligator like you could in a boat. If you’re a boat, you can let the alligator pull the boat around and not have to worry about trying to stop that alligator from taking all your line like you would if you were on land. In Florida you can NOT use a firearm to hunt/dispatch the alligator. You have to use a bang stick or other means to dispatch the alligator, not a firearm. Did we bring the bug spray? So you have your alligator tags from the fwc, you have an idea of the equipment you can use, now you have to give thought to your hunting plans. Your tactics. This is the first method that comes to mind. You are out looking for an alligator, you see one, and you go after it! This is the method I use the most. If you have sunlight, use the binoculars. No sunlight? Time to use the spot light. Majority of the time, you will only see the head of the alligator unless its on the move. If it is on the move you will see the back of the alligator as it moves through the water, and if the water is like glass where you are, you will see a small wake. At night, when you are using the spot light, you normally wont see this. 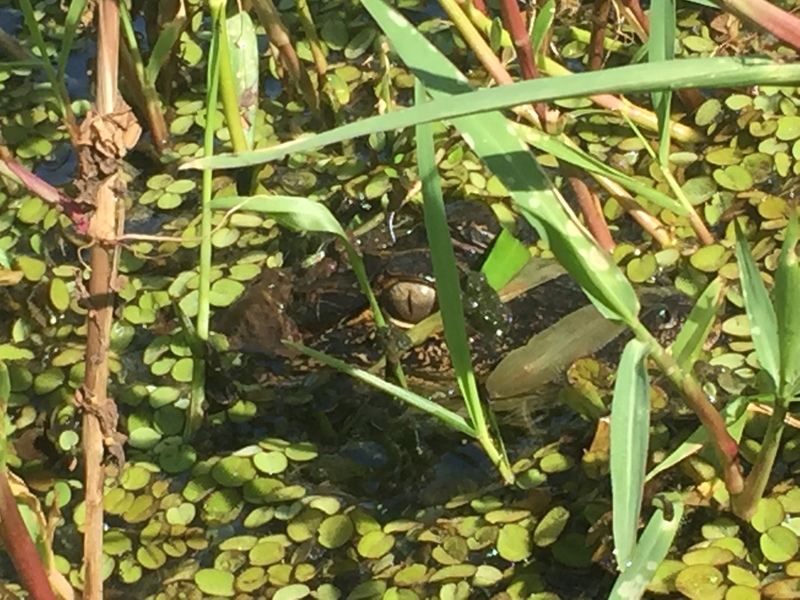 You will only see one, white reflective eye moving across the water. If you are lucky, and the alligator is heading your direction, you will see two eyes. Depending on the gap you see, it can help give you an idea of how big the alligator is. You will also see other white eyes on the shore. I’ve noticed some to be yellowish. I found some of these reflections to be frogs. So don’t get too excited when you see all those reflections! Unless you see it up close, within casting distance of your rod and reel, it is DIFFICULT to size an alligator! Alligator spotted! Don’t head straight for it! Act like you aren’t hunting for alligators. If it wasn’t alligator season, you wouldn’t be chasing after an alligator. Alligators normally aren’t chased, so if you start now its going to get skeptical, go under the water, then you’re have to stop and wait for it to come back up, and then the game starts. I like to act like I’m fishing. Just follow the shore line nice and slow. Usually I don’t like to get in between the alligator and the shore. I have had a lot of alligators go underwater when this happens. In most cases the alligator does go under the water, but you want to be as close as you can when it does. There is normally two things the alligator does when it goes under water, and sometimes it will give it away! Look at the position of the head when it goes down. When casting, face your body toward the alligator. Cast straight over your head. Don’t do a side cast (its not reliable enough and you normally don’t get a retry). Aim past the alligator, and make sure your bail is open! You look really goofy if its not. Cast over the alligator and start to reel. If the alligator is still on top of the water, you don’t have too worry too much about the treble hook sinking deep enough. If you spooked the alligator and it went under the water, let that snag hook sink a little more, but still reel it quickly if you feel like that alligator is going to swim off. You will feel a sudden stop where you think you hooked a log. Maybe you did, but hopefully its not! I thought I did, and I did. I pulled up a group of christmas trees haha. Once you feel that weight, reel down and give it a nice even, solid pull. Don’t give it a quick hook set. There’s no need too. Then, GAME ON! What I have experienced, is if the base of the head goes down first and the nose is the last part that goes under water, the alligator has most likely just sunk to the bottom. The alligator is going to wait for you to go by, so it can get back to what it was doing. So I will continue my path down the shore line and go past the position of the alligator, and then come back to where I thought I saw it go down. I have the snag hook rod and reel in hand ready to cast. Normally, if the alligator doesn’t feel pressured, it will come up in less than 10 minutes. If it feels pressured, it can be 30-45 minutes. Yes, I have waited that long, and it payed off for me. So the main goal is to get over top of it where you thought it went down, so when it comes back up, you have a casting distance that is covering a large area. This gives you the best chance of the alligator popping up with in your cast area so you can snag him with your snag hook! If the head of the alligator goes down evenly or quickly, or even splashes, it’s onto your non-sense and it doesn’t feel like dealing with it. If its really mad, it will crawl or swim a long the bottom where is loosens up the debris and sediment, and that’s where all those air bubbles come from. So you can follow that air bubble trail but in most cases, if its an open lake, you most likely are not going to get that. 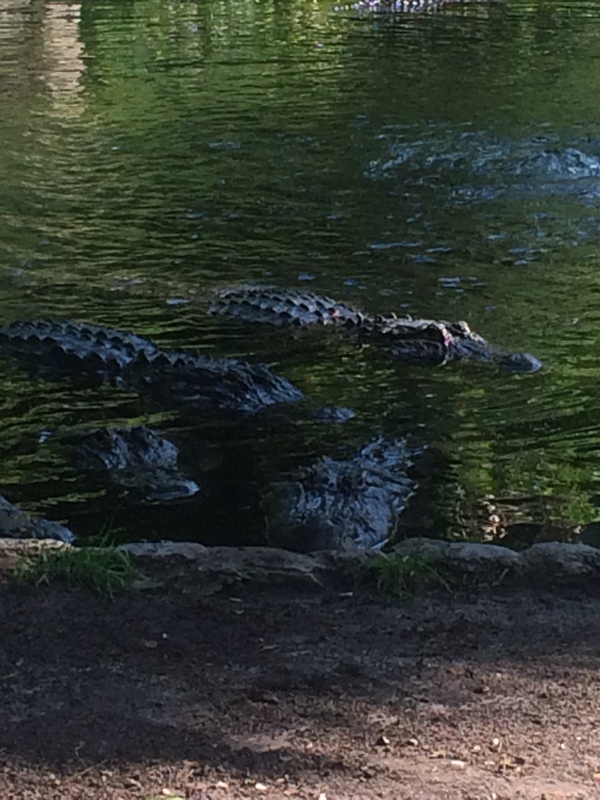 These alligators are FAST! I have had alligators out swim my trolling motor that was on full power. You may not catch them. Sometimes they’ll head out to the middle of the lake or go into the shore line. It gets very difficult when you play this game and it is very time consuming. Especially at night. I haven’t had much luck with this, but I also never really tried using it all that much. You use this method when you know an alligator is in a certain area. Don’t just go hang a bait and wait for an alligator. You’ll be waiting a while. The main thing I try to achieve while doing this, especially dealing with raw, rotten chicken, is staying somewhat sanitary. I like to use food/medical gloves when handling it, keep some hand sanitizer on the boat, and have a dedicated cooler for this so you can isolate it. You can use a lot of things and techniques…. I have just used fish and/or chicken. Rotten or fresh. Keep a good distance away from the bait. Hopefully you did your research and know the behavior of this alligator you are targeting. Put the boat around the corner or down the bank. 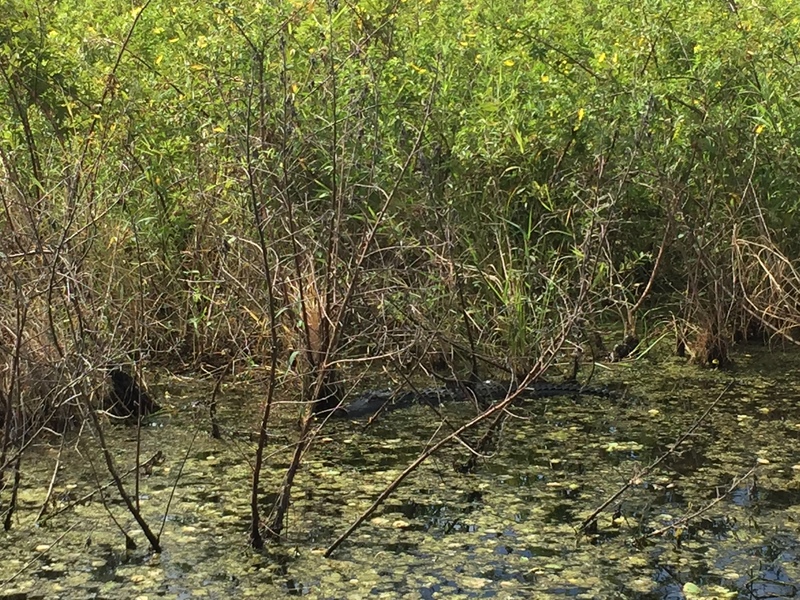 Try to stay out of the alligators line of sight and path that it swims. Try to have a sight line if you can. If not, you could probably put a small bell attached to the line or clothes pin so you know when something gets it. Let it take the bait. Allow it is to swallow it. wait a few moments and then make your way to the alligator while reeling in your line. Don’t put too much pressure on the line. You don’t want to pull it out of the alligator. Once you get close enough use a snag hook, bow and arrow, or harpoon to get a more secure line on the alligator. If you are hanging it, you can not leave it unattended. It has to be attached to your boat or to a fishing rod on the boat. You have to be in constant contact with your bait. I use black 550 paracord. It is strong and thin. I use a 24″ to 36″ length. Drill a hole in the wooden peg, remember the peg has to be less than 2 inches in length, and feed the paracord through that hole and tie a knot on the other side. Tie a figure eight on a bight on the other end of the paracord, put a small oval screw lock in the loop so that I can tie my fishing line to that. So I have the baited peg that is attached to a 24 to 36 inch length of paracord, that is attached to my fishing pole. I have found this be the easiest way to to this. You could also use cable instead of paracord. You can use a clothes pin to help keep that bait suspended at a certain level above the water. I can normally tie or zip tie the clothes pin to the branch and then feed the line through the mouth or the end of the clothes pin to keep the bait where I want it. 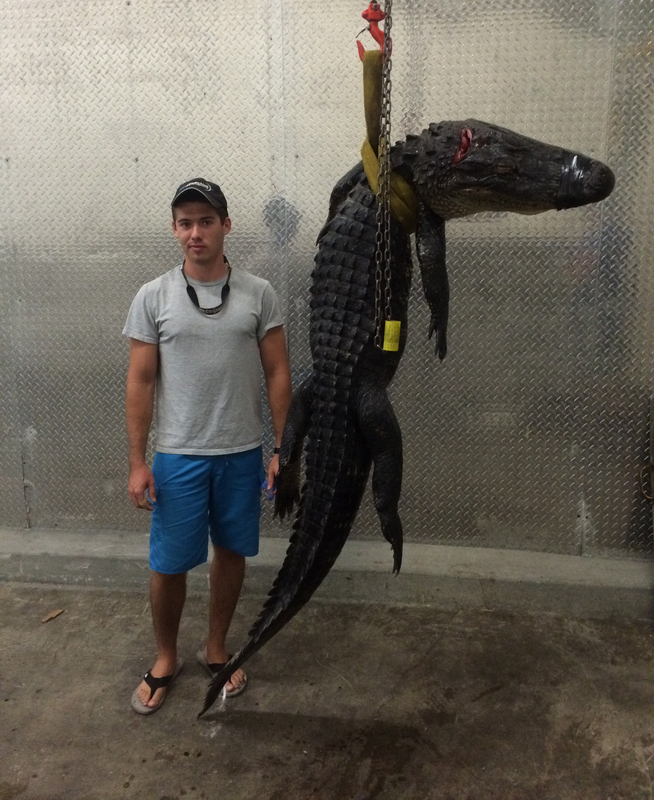 I really only target alligators over 8 feet so I hang the bait around 18″. Keep in mind that you may have birds or other animals come down the tree to get the bait. I have had vultures bounce on the tree limbs to try and get it off the branch. Just something to keep in mind. Run and Gun – A method where people run their boat at a high rate of speed and try to harpoon or bow and arrow an alligator. You can find it on YouTube where this is being done in an airboat. I have not used this method before. Any other methods will just use a combination and spot and stalk and baiting. As long as you know how to use your equipment, you should do just fine! Once you get a chance too, whether it is five minutes into the fight or an hour later, whenever you get the opportunity to dispatch the alligator do it. I use a bang stick that is chambered in 357 magnum. Get the alligator’s head up to the surface, find your target (right behind the moon), let the alligator sink below the surface of the water, aim for your target spot and strike it hard with the bank stick. Its not a push motion, its a strike. Like you are harpooning it. You want to make sure the round goes off. You bang sticked it, and you think its done. Now the alligator needs to get in the boat. Before messing with that, you have to make sure the alligator is dead. The alligator needs to have the mouth taped shut and the brain and spinal cord separated. The purpose of cutting behind that half moon is to make sure the spine is severed and main arteries and veins are cut, along with making sure the brain is scramble. This will ensure that the alligator is dead. Taping the mouth shut is a safety precaution to make sure no fingers or limbs find there way in there. 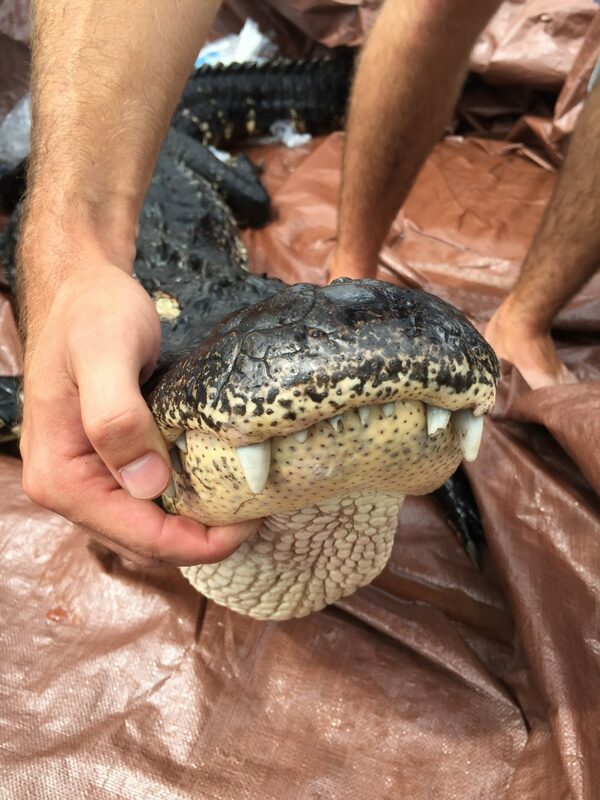 At first, in the moment, you will not want to reach down there and grab that head… I use a small gaff to get a hold of that lower jaw to help close the mouth and get the alligator head up into position to grab it, tape it, and then cut it. Getting it in the boat is a challenge if its a big alligator… You’re almost there! Get that head up into the boat as far as you can. Then I like to use my knee to push down on the head and roll the alligator into the boat, one leg at a time, with the tail being the last part entering the boat. Lean the head off of the bow or put it in a garbage bag. The main purpose is to not get all that blood in your boat. It took a while to get out of the carpet on the bass boat. Now you have to tag your alligator. Get one of your CITIES tags and a knife. The tag goes within 6 inches of the tip of the tail. Make a small incision in the tail that will fit your CITIES tag. Holding the tip of the tail in one hand and cutting away from that hand, cutting towards the head, make a 1 inch cut. That should be plenty big enough to insert the tag through. Once through, lock the tag and make sure it is locked. You have a legal alligator in you boat! Congratulations! Relax and take it in! Continue your hunt or call it a night? Up to you. Once you get back to the dock or ramp your next move should be cooling down the alligator. No matter if you are cleaning it yourself or selling it, you need to cool it down. I use my pickup bed and a tarp. Put the tarp in the truck bed, slide the alligator up into the bed on the tarp, lay bags of ice all over the tail, body, and head. I use 8-10 bags of ice. Wrap that alligator up! It will keep for a few days like this. In Florida. In the sun, one day is fine, but your are gonna have to add more bags of ice once night comes back around. Clean it yourself or Sell it? You can either clean this alligator your self, or sell it. There are many different options. You can sell it and buy your hide back, sell it and buy your meat back, sell the whole alligator, or just do it all yourself and keep it all. I like to call ahead, before season starts, to make sure that the people I normally do business with are still doing it the next year. On FWC’s site, you can find a list of the people who are licensed to buy these alligators from you. It is a big project cleaning your own alligator. I have done it once. I enjoyed the experience but it is not for a lot of people. If you sell it, make sure to take your harpoon dart or arrow tip out of the alligator yourself. I have dealt with two different dealers that I sold my alligators too and neither one got my arrow tips back to me or even compensated me. They both said they would but they didn’t. I also wanted my heads back. One dealer misplaced my head after two weeks and I wasn’t able to get it back. So make sure to stay on top it! These guys are busy so try to get your stuff back as quick as possible so they have less time to misplace it and mess up. Alligator season is very complex. Once you understand all the rules and regulations, have all the gear, and understand a little bit about alligators, it becomes an obsession. If you do not feel confident enough going out yourself, set up a guided trip with guides in your area. There may not be any in your area, but look at counties that surround yours and you will most likely find one. There will be reviews on the items I have been using for a few years and let you know what I think about them. I will also try to record my experiences on camera and upload them to the JTgatoring YouTube channel. I hope you enjoyed this article, and learned a little something while reading. Thank you for stopping by JTgatoring, I hope to see you around! Subscribe to the JTgatoring mailing list!